The sauna is designed by Studio Puisto and is called the Tullin Sauna, which translates to “customs sauna.” Constructed in what was formerly a warehouse for the nearby railway station, Tullin Sauna is a public sauna that functions as a related extension to Dream Hotel, also designed by Studio Puisto Architects, and located across the street. Designed to be a reprieve from the bustle of urban life, the Tullin is tucked in the heart of a former industrial red-brick neighborhood. The project’s name takes root in local customs, and the purpose is to create a gathering place for residents and visitors. Tullin is designed to serve as a korttelisauna, or “neighborhood sauna.” The 19th century was a time when space in Finnish cities was limited and many homes were too small to have their own washrooms. So, korttelisaunas were built to serve as communal bathing areas. These ultimately took on the role of gathering places where people came together to bathe and socialize. The building also houses a co-working space and a bistro, and serves as a communal space for locals, as well as the guests of the Dream Hotel. 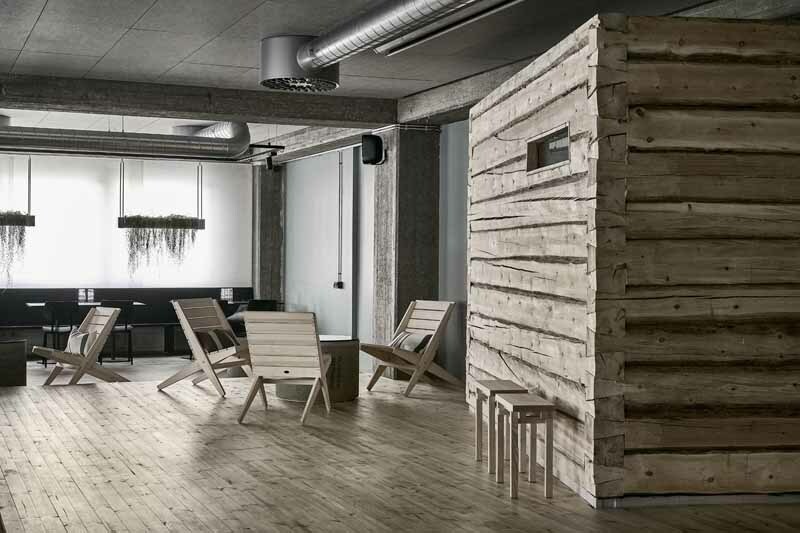 One of the most prominent materials is natural, warm Finnish pine to contrast with the cooler, rougher concrete textures of the warehouse. 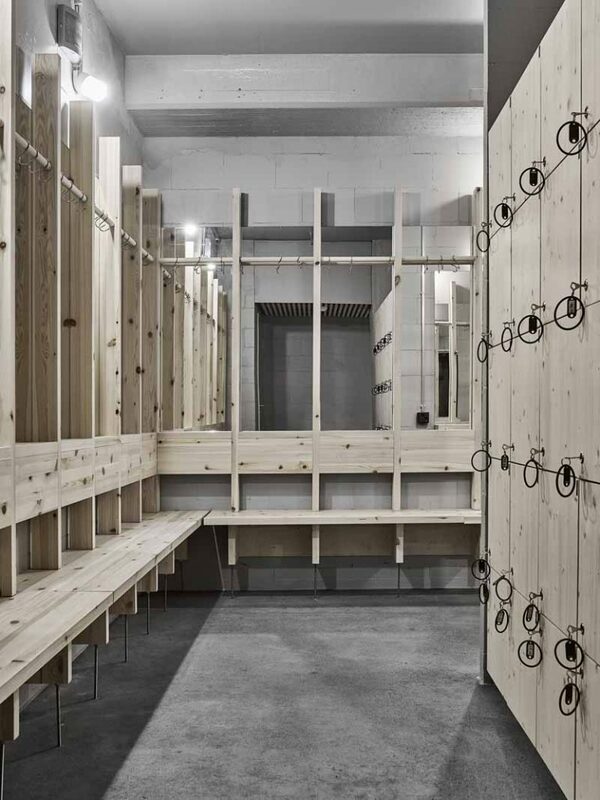 The building features traditional wood-burning Finnish saunas constructed by local craftsmen. 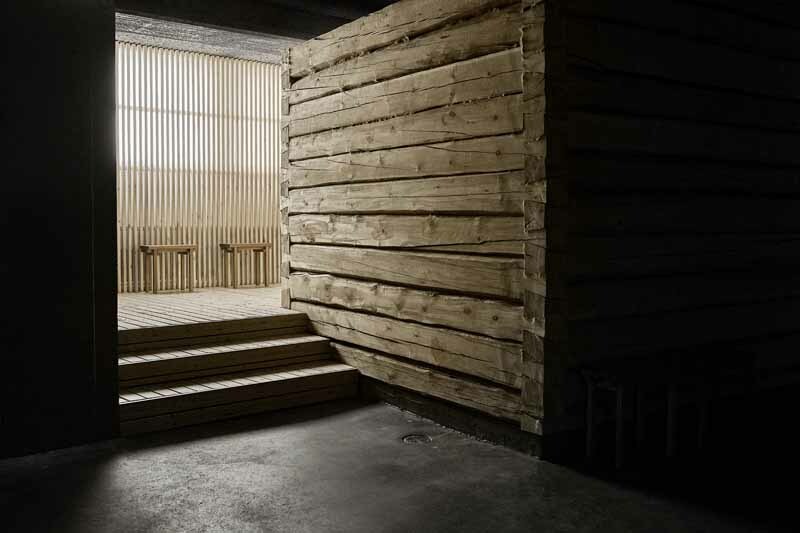 To keep the feel of the space, including the bistro and co-working space, true to the ritualistic calm that it represents, one of the log saunas physically cuts into the reception and bistro with a small but tinted window offering a peek inside. Adding to this effect, the exterior windows are given a soft and milky appearance to make it seem like they are fogged up from by the sauna’s steam.